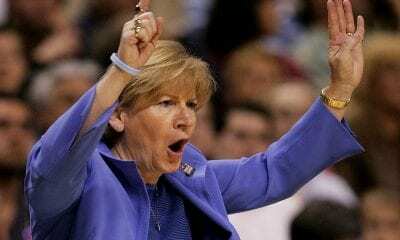 Fans of women’s college basketball have come to accept the reality when someone mentions the NCAA Tournament. If you want to know who will win the national championship, you start with UConn and Notre Dame and then maybe work your way down on occasion to Baylor, South Carolina, Louisville or Mississippi State. The point is, great programs often stay that way for decades, leaving very little room for new teams to make strides. It’s very rare for No. 1 or No. 2 seed to lose an Elite 8 game. However, this year could be a little different. There are six or seven teams that could win this year’s title. The race is as wide open as its ever been. And here’s a look at 10 teams who could do it. The Lady Bears have occupied the top ranking in the polls for the last seven weeks, their identity as a championship contender amplified by its home win over UConn, the first regular-season loss for the Huskies since 2014. Baylor’s only loss of the season was at Stanford and its won 23 straight. This is a proud program, a two-time national champion that spawned Brittney Griner, the WNBA star and Olympian. They’ve won nine of the last 11 Big 12 championships. They last won the national championship in 2012 and are led by a formidable post combination of center Kalani Brown and forward Lauren Cox. The Greensboro region seems very winnable, although No. 2 seed Iowa could be one of the tourney’s surprise teams. Baylor has not been back to the Final Four since 2012. For the first time since 2006, the 11-time national champion Huskies are not a No. 1 seed. Road losses to Louisville and Baylor, and the lack of respect generated by playing in the poor American Athletic Conference, doomed them this season. The Huskies, who have played in 11 straight Finals Fours, have not won a national championship since 2016 when Breanna Stewart, Morgan Tuck and Moriah Jefferson concluded a run of three straight titles. Aside from Hall of Fame coach Geno Auriemma, UConn is led by seniors Katie Lou Samuelson and Napheesa Collier. The defending national champion heads the Chicago Regional and seems primed for another run. 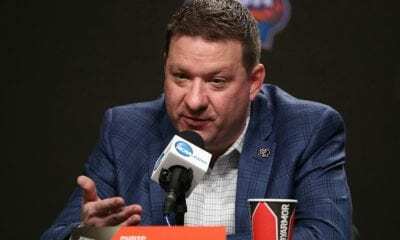 The Irish won last year’s championship with two miraculous wins engineered by last-second shots against Mississippi State and UConn by guard Arike Ogunbowale. After losing to ACC rival North Carolina in January, and losing to UConn in South Bend, the Irish spent the remainder of the season trying to make amends. It finally did by beating Louisville in the ACC tournament championship game. Unlike most programs in the sport, Irish fans travel very well. If they advance to the Sweet 16, they’ll be playing in Chicago, which is a mere 90 minutes away from home, cutting down on jet lag. And in case you’ve lost track, the Irish and Huskies have met seven times in the Final Four, six in the last eight seasons. Jeff Walz is one of the most underrated coaches in the women’s game. 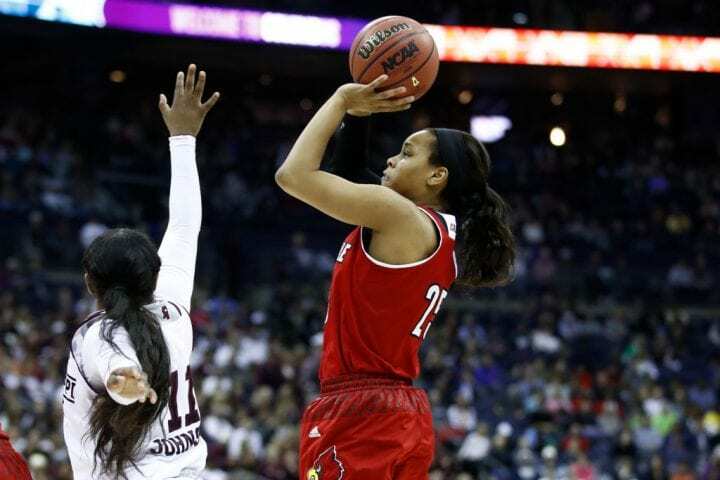 The Cardinals have been a contender for his entire career, but their days in the Big East Conference were consistently darkened by the presence of UConn, even when All-American Angel McCoughtry was with the program. 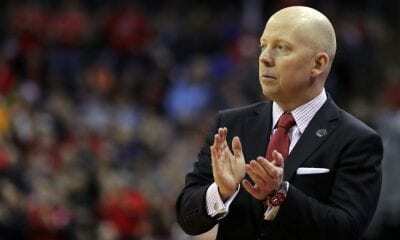 Louisville cleared a major hurdle this season by beating UConn at home. It was the first time the program had defeated the Huskies in the Walz’ era. And they did so with one of the nation’s top guards, Asia Durr, leading the way. But they lost by 20 points to Notre Dame in the ACC title game. Of course, if the Cardinals want to get to another Final Four they likely will have to beat UConn again in an Elite 8 game in Albany, N.Y. And we’ll see how that goes. The Bulldogs are the No. 1 seed in the Portland Region, the second straight year they’ve earned top billing. They are after a third-straight Final Four. They’ve lost the last two national championship games, one to South Carolina, the other to Notre Dame. Oregon was the only team to defeat the Bulldogs in non-conference competition and Missouri beat them in SEC play. But Mississippi State paid the Tigers back during the SEC tournament. Playing in Portland could be a disadvantage if Oregon, the No. 2 seed, makes it to the Elite 8. Bulldogs coach Vic Schaefer is considered a defensive mastermind, but his team was led this season by 6-7 center Teaira McCowan, who most certainly will be a WBCA All-American. As we’ve mentioned, being seeded No. 2 in their home state – the only West Coast team in the region – can only help the Ducks, one of the nation’s surprise powerhouses this season. Oregon has one of the game’s best players in guard Sabrina Ionescu, the Pac-12 player of the year. She is an ESPNW first-team All-America who averages 19.6 points, 7.5 rebounds and 8.1 assists. She is the only player in the nation averaging more than 14 points, seven rebounds and seven assists. The Ducks have lost in the Elite Eight the past two seasons and have never played in a Final Four. Oregon won the Pac-12 regular season, but lost the Pac-12 Tournament championship game to Stanford, the 2-seed in the Chicago Regional. 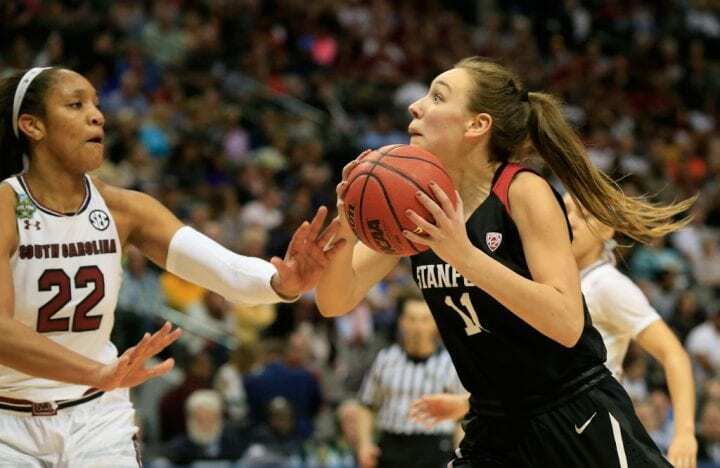 One of the legendary programs in history, coached by Hall of Famer Tara VanDerveer, the Cardinal are back at it again and filled with confidence after their win over the Ducks last week at Pac-12 tournament. This will be its 32nd straight NCAA appearance. Should Stanford and Notre Dame meet in Chicago, the Cardinal will play knowing it beat the Irish in the Elite Eight in 2017 and the Sweet 16 in 2016. It’s been an up-and-down season for Stanford. They beat Baylor, but then lost to Gonzaga, which isn’t quite as good in women’s basketball as it is in the men’s game. One of their best players is Australian Alanna Smith, who is averaging 19.6 points. If the Hawkeyes have a chance to win a national championship, it will be because they have quite possibly the best player in the nation in center Megan Gustafson, ESPNW’s national player of the year and the leading scorer in Division I.
Iowa is the No. 2 seed in the Greensboro regional — the best seed Iowa has ever landed under coach Lisa Bluder. Of course, top seed Baylor is waiting at the other end of the bracket. The Hawkeyes won their first Big Ten Tournament title since 2001 after finishing second in the regular season. And they are rolling having won five straight, 10 of 11, and 15 of 17. But they have made it to the Sweet Sixteen only once since 1997 and haven’t been a No. 2 seed since 1996. Injuries have been a major problem for the Wolf Pack and, frankly, it would require a major miracle to win the championship from their perch as the No. 3 seed in the Greensboro region. Its been rare for the Wolfpack to have a full complement of players for games this season, but coach Wes Moore said Monday his team has managed to fight through the disappointment by losing only five games. They are also ranked No. 10 in the nation. Kiara Leslie leads the team in scoring and rebounding. The Wolfpack finished third in the ACC regular season and made it to the semifinals of the ACC Tournament. Had it not been for Gustafson, the Terrapins might have won the Big Ten tournament title. But their defense broke down and allowed her to score 45 points, exactly half of the 90 Iowa needed to win by 14. Maryland does have a star of its own in Kaila Charles. And she scored 36 in the title game. Maryland will make its ninth-straight NCAA tournament appearance and 27th overall. The Terps have advanced to the second round each of the last eight years, making five Sweet Sixteen appearances, three Elite Eights and two Finals Fours during that stretch.